The New York Mets will be satisfied with Corey Oswalt the remainder of the season as long as he pitches somewhere every fifth day. But the Atlanta Braves will need a lot more out of Julio Teheran than just perfect attendance down the stretch if they are to end a four-year playoff drought. Oswalt and Teheran are scheduled to oppose each other Sunday afternoon, when the Mets host the Braves in the finale of a four-game series at Citi Field. The Mets snapped the Braves' five-game winning streak Saturday night, when Zack Wheeler and a pair of relievers combined on a five-hitter in a 3-0 victory. [post_ads]Oswalt (1-2, 5.27 ERA) will be pitching in place of injured left-hander Steven Matz (flexor pronator strain) as he continues to audition for a spot in next year's rotation, which is likely to be led by Wheeler, Jacob deGrom and Noah Syndergaard. The Mets (45-63) held on to all three right-handers at the trade deadline in hopes of contending in 2019. While his ERA remains bloated from a rough first two big league outings earlier this season, Oswalt impressed the Mets in July, when he produced a 3.60 ERA and limited opposing batters to a .162 average. Oswalt earned his first major league win in his most recent start July 25, when he allowed two runs over five innings as New York beat the San Diego Padres 6-4. The surge coincides with more regular usage for Oswalt, who went more than a week between starts five times through June as he made three trips between the Mets and Triple-A Las Vegas. He had one extended break in July -- because of the All-Star Break, Oswalt went 10 days in between his two most recent big league starts -- and pitched for Las Vegas on Monday night. Mets manager Mickey Callaway didn't commit to keeping Oswalt in the majors beyond Sunday but said the team plans to have him take a regular turn in a rotation somewhere. "We just need to get him pitching every fifth day," Callaway said. "When his schedule was messed up a little this year, he scuffled, and then when he started getting on that normal routine, he started pitching well again. It's not necessarily we want to see him up here, but we definitely want to get him on a schedule where he's pitching every fifth day to give him the best chance to get in a rhythm and work on the things that are going to lead to success." Teheran (8-7, 4.46 ERA) has enjoyed plenty of success in the past for the Braves (59-48), but he has been arguably their worst starting pitcher this season. The right-hander, who has reached 30 starts and 185 innings in each of the past five years, has the highest ERA of the three Atlanta pitchers who have thrown at least 100 innings. He has also given up a league-leading 21 homers while issuing a career-high 4.5 walks per nine innings. 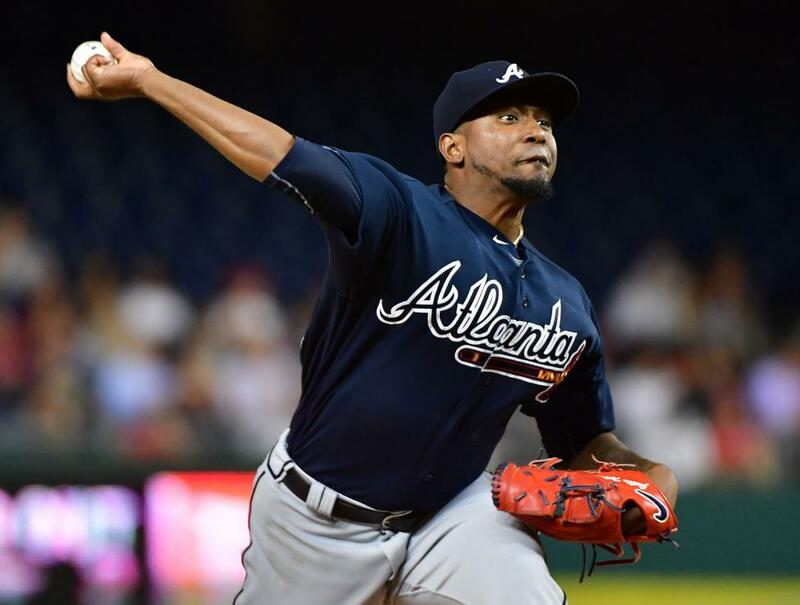 The Braves, who are 1 1/2 games behind the Philadelphia Phillies in the National League East and are a half-game ahead of the Los Angeles Dodgers in the race for the second wild-card spot, hope Teheran found something in his most recent start Monday. In that game, he earned the win after allowing three runs over five innings as Atlanta beat the Miami Marlins 5-3. Teheran allowed two runs on two hits and a walk in the first inning but allowed just five baserunners the rest of the way. "He just kind of got loose and the breaking balls became more of a factor," Braves manager Brian Snitker told reporters afterward. "Just seems things started (to) seem to flow for him." Oswalt has never faced the Braves. Teheran is 9-6 with a 2.33 ERA in 23 games (22 starts) against the Mets, the team he has faced more than any other opponent. The ERA is also Teheran's lowest against any team he's opposed more than 10 times. In his three starts against the Mets this season, Teheran allowed two earned runs over 21 innings, although he is 1-1 in those three appearances. Teheran victimized New York for the most recent of his three career shutouts June 19, 2016, when he twirled a one-hitter in Atlanta's 6-0 win at Citi Field.